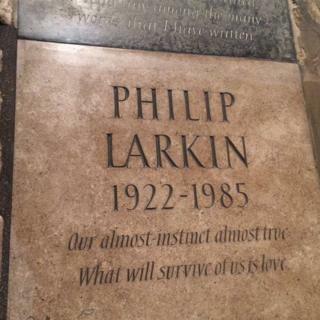 Philip Larkin has been commemorated in Poets' Corner in Westminster Abbey on the 31st anniversary of his death. Actor Sir Tom Courtenay and artist Grayson Perry both read from Larkin's work during the unveiling ceremony. It marked the end of a long campaign by the Philip Larkin Society to have him added to the existing names in Poets' Corner. The memorial floor stone contains two lines of poetry, his name and birth and death dates. The chosen lines are from the end of An Arundel Tomb which was first published in the 1960s. The stone has been sculpted by Martin Jennings, whose previous work includes the Larkin Statue and roundels on Hull's Paragon Station. Professor Edwin Dawes, chair of the Philip Larkin Society, said: "We are delighted that Philip Larkin has finally taken his place at the very cultural heart of the nation, amongst Britain's greatest writers." Larkin was born in Coventry in 1922 and went on to study at Oxford, with his first poems being published in 1940. He became a librarian and took a job at the University of Hull in 1955 where he stayed until his death in 1985. Poets' Corner is a section of the South Transept of Westminster Abbey and acquired the name due to the number of playwrights, writers and poets who are either buried or commemorated there.